Advancements in dentistry now give you multiple options when it comes to resolving tooth loss, but which is really the best option? While dentures have held a common place in tooth replacement for more than a century, they simply can’t compete with the benefits of dental implants. Although both fill the space of missing teeth to improve oral function, only one is able to offer a permanent solution that improves oral health and stops additional damage. As the experts for tooth implants in Boston, Kraft & Schrott Dental Associates have the facts you need to know about implants for replacing teeth. It’s a well-known fact that implants will correct your smile with a permanent solution to tooth loss, but did you know the benefits of implants extend beyond just the visual aspects? With a 95-98 percent success and satisfaction rate, implants are proven to promote your oral function and health. In fact, when compared to dentures, implants allow for substantially more biting force, allowing you to eat whatever you want without concern. The success and satisfaction of implants is based on a process called osseointegration in which a bio-compatible titanium post firmly fuses with the jawbone, creating a very stable anchor for replacement teeth. Titanium is a strong, incredibly durable material that’s widely used by NASA for space shuttles. 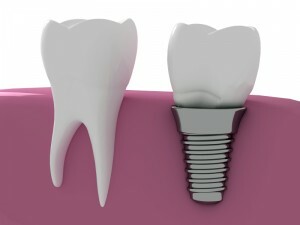 With the titanium post being bio-compatible, the body accepts the implant, allowing you to have no risk for rejection. With the implant in place, you give your teeth and bones the support they need to stay healthy. When you’re suffering from tooth loss, the lack of stimulation causes your supporting bones and structures to begin to deteriorate. Overtime, this causes the teeth to shift, increasing the risk for tooth decay, gum disease, and additional tooth loss. As a result, your remaining teeth will stay exactly where they should, decreasing your risk for additional damage. While dentures cause additional bone loss, implants prevent additional damage from occurring once a tooth has been lost. This added support also allows you to maintain proper facial structure, so you don’t have to worry about developing sunken lips or sagging cheeks. Implants are also more hygienic than dentures, require less maintenance and produce less discomfort. Overtime, as your gums and bone begin to shrink, dentures no longer fit well. This causes irritation to the gums, which can lead to sores. Implants on the other hand fit securely in place, protecting your gums from damage. Kraft & Schrott Dental Associates provide the excellent specialized dental care you need to promote your oral health with dental implant therapy. We will treat missing teeth using the best replacement option available. Don’t let missing teeth damage your oral health or smile any longer. Call us today at (617) 758-8058 today to schedule a consultation.